The Drill Table presents a live summary of all drill holes present in the board. A standard element required for manufacture of a Printed Circuit Board is a drill drawing table, also known as a drill table or a drill drawing legend. The drill table lists the size and number of holes for each drill used on the board. 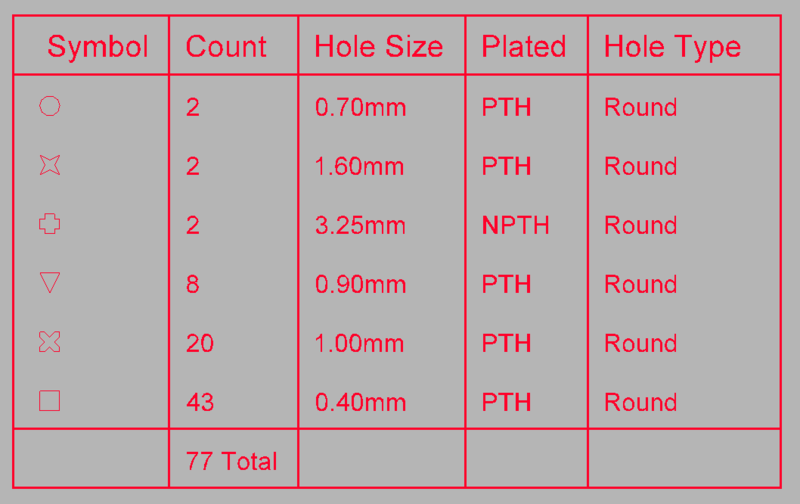 Each drill size can be represented by a symbol, a letter or the actual hole size. When a drill drawing is generated for the board, each actual drill site is marked by a symbol, as shown in the image below. The drill table updates in real time - as hole-containing objects such as pads and vias are placed or removed from the PCB design, the table updates. Click Home | Board | . After launching the command, a drill table will appear attached to the cursor. Position the table in a suitable location outside the board and click to place it. Note that the attributes can be modified during placement, press Tab to bring up the Drill Table dialog. Changes made will affect the object being placed, and subsequent objects placed during the same editing session. This method of editing uses the Drill Table dialog to modify the properties of a drill table object. Edit the properties of the Drill Table in the dialog. Note the Instructions column, this is a user-defined column. 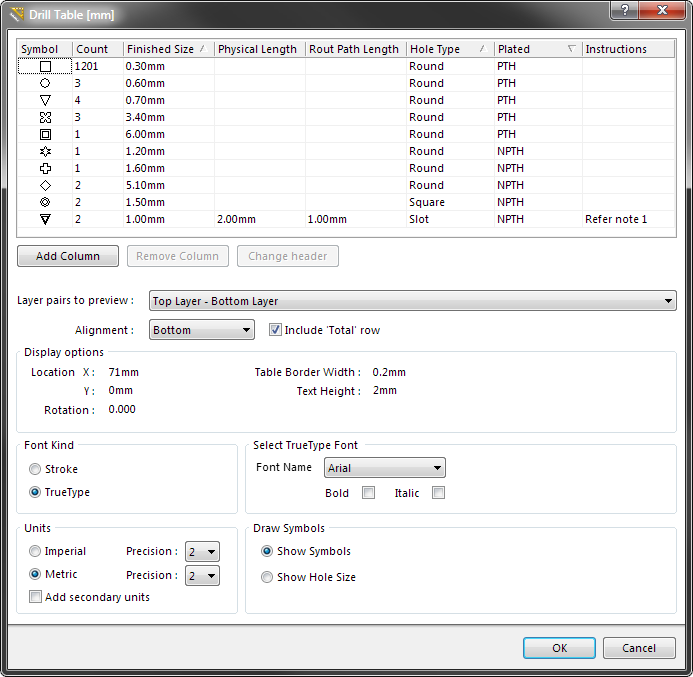 The Drill Table dialog can be accessed prior to entering placement mode, from the PCB Editor – Defaults page of the Preferences dialog. This allows the default properties for the drill table object to be changed, which will be applied when placing subsequent drill tables. Double-clicking on the placed drill table object. Placing the cursor over the drill table object, right-clicking and choosing Properties from the context menu. Finished Size (to order by size). Sort the drill table by clicking the column headings, hold shift and click to sub-sort by other columns. The drill table supports multi-layer boards that use layer-pair drilling. To support the designer in using the drill table during the design process the table includes the Layer pairs to preview option, set this to restrict the table to only show the drill holes for just the selected layer-pair. Note that the Layer pairs to preview option is not used to control which layer-pair drilling is included in the drill table during output generation, that is defined by the Drill Layers setting in the Layer Properties dialog in the output setup. That means that a single table can be placed on the design, the table will only include the appropriate layer-pair data during output generation of a drill drawing of that layer-pair. The drill table location can be precisely defined by configuring the Location X and Location Y settings if required. It can also be rotated if necessary. The grid lines in the drill table are actually Line objects, use the Table Border Width to set the Line width. Both Stroke and TrueType fonts are supported for text display in the drill table. Stroke fonts are native to the software and are supplied as part of the installation. TrueType fonts will be those available for this installation of Windows. Set the Units to Metric or Imperial, and the precision for each as required. Enable the Add secondary units option to display both types of units. Configure the assignment of Symbol-to-hole size in the PCB Hole Size editor (PCB panel). The assignments are stored in the PCB file. There is a total of 15 symbols available, as shown below. If there are more than 15 different hole sizes in the PCB then letters are automatically assigned. The 15 pre-defined graphical symbols that are available. Click and hold anywhere within the drill table, then move it to a new location in the PCB editor workspace. The drill table is automatically sized based on the specified Text Height setting, as well as the number of different hole sizes (rows) and the number of defined columns. To interactively resize the table, click once to select it, then click and hold on a corner vertex. The Confirm dialog will appear, reporting that the table is locked, click Yes to continue and resize the table. Note that interactively resizing the table will also increase the font size. When the board includes layer-pairs, the displayed layer-pair is controlled by the Layer pair to preview option in the Drill Table dialog. This chosen layer-pair can also be switched using the PCB editor right-click menu, simply right-click on the drill table and select the required layer-pair in the Drill Table sub-menu. The drill table will appear on all output that includes the Drill Drawing layer. The image below shows an example of drill drawing output, showing each drill site marked by the symbol that has been assigned to that hole size. This example output also include the Drill Guide layer, which adds a small cross at each hole site. Example output of the Drill Drawing layer showing the Drill Table next to the board, with each drill site marked by the appropriate hole size symbol.